Home // News // A Successful 25th Anniversary Open House! A Successful 25th Anniversary Open House! We’d like to sincerely thank all those that came out to help us celebrate our 25th anniversary at our open house on November 14th! 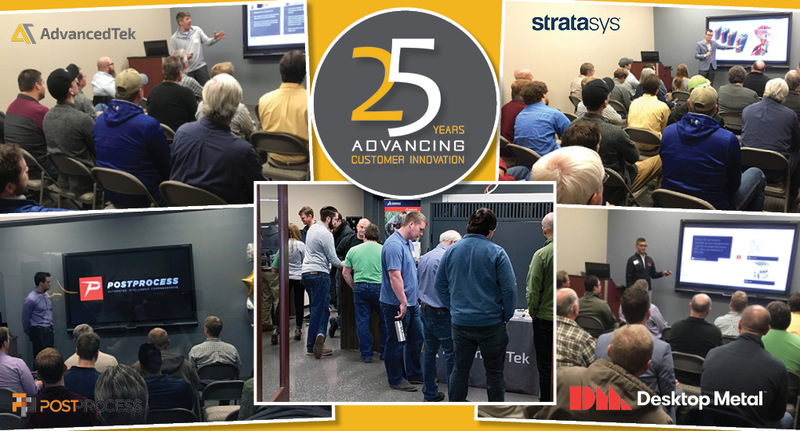 We had a great turnout, from longtime customers we are proud to call our friends, to new faces interested in learning what our 3D printing technologies can do for their business. We’d also like to thank our presenters David Busacker of Stratasys, Jigar Patel of Desktop Metal, and Ryan Hoag of PostProcess, as well as our two guest customer speakers James Larson of Cretex Companies and Corey Brown of Devicix. We were also happy to have our friends from Alignex in-house to chat SolidWorks with our open house guests. AdvancedTek believes its 25 years of professional industry knowledge, along with a fully equipped TekCenter and multiple solution offerings, provides current and potential clients the opportunity to learn firsthand the power of working with us. We understand the importance of customer support and having the ability to offer cutting edge products that reliably fulfill customer demands. AdvancedTek strives to continue providing for this same high level of service and dedication for decades to come. AdvancedTek© 2018. All Rights Reserved.